This summer, Lynn and I wondered what we would do for our organization's first birthday. Throw a party? Host a pot-luck dinner? Bug the Milwaukee news outlets until they ran a story about us so more parents could join us and learn the unpredictable, exciting, lump-in-the-throat joy that is volunteering with children? In the end, we celebrated with simplicity and gratitude and returned to the place of our first mission. On a very windy morning in Milwaukee, I packed my kids and their costumes into my car. As we drove down to St. John's, I talked with my five year old son about how it's great to say "Trick or Treat" and "thank you" but it's also nice to say more. I suggested he talk about his costume, ask the residents questions, compliment them. He added, "and show them my karate moves." When we showed up, we were greeted by friends, people my children and I have come to know and love over the past year. I smiled at how our group has grown with new families and new family members born. The staff greeted us and led our mini-Halloween parade through the doors. 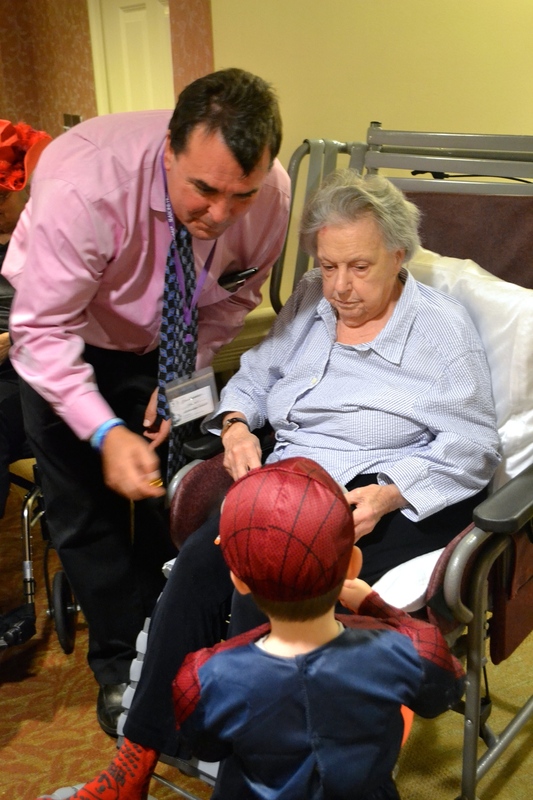 We were surprised to find the residents and staff lining the hallway in Halloween costumes, just like us. Our children sang a song for them and once again, we were surprised to find that they had prepared a song for us. It was a life moment- to feel the light and love in that hallway. I will never forget it. And YES, I cried- when young and old serenaded each other in ninja and cowboy costumes and when I watched my son walk through the halls handing out thank you cards and initiating conversations with everyone. I am shocked to see how TOAM has grown in one year. I love to watch our organization shift and stretch as more families get involved and start to share their ideas for our group. Now that we have a board and are old enough to have "regulars," Lynn and I say to each other more and more "I never would have come up with that idea!" It's absolutely thrilling. A milestone calls for reflection and I must share with you how I see our one year anniversary changing the lives of my children. Yes, they hear "I need to just get a little bit of work done for TOAM" more frequently. Yes, they have new friends and have a wider network of adults who care for them. But on the level Lynn and I most hoped for, I have seen change. My children care more and are more conscientious about the world. As I type this, I am on a trip to see my 91 year old grandmother. My children and I have not seen her in two years. Since they are only three and five, they did not remember being around her. Prior to the trip, my son asked me "Will Grandma be like the people at St. John's?" A little while later, he said he would like to do crafts with her and take her out to breakfast. Today was our reunion. My babies smiled and performed their ballet and karate moves for her. My son spoke loudly when she asked him to and moved in close to chat while making a craft. It was an unforgettable morning and I know TOAM helped make it so beautiful. Thank you, TOAM. Thank you to everyone who welcomed us in our first year. Older PostLet's Get Physical at Harwood Place!